Aftering having such a wonderful time at the last Saks Fifth Avenue event, I'm excited to share they have another upcoming event to be held in Raleigh, North Carolina. This event is presented by both Saks Fifth Avenue and David Yurman and invites you to Unlock for a Chance to Win. The event will be held on Thursday, November 21st from 4-7 p.m. 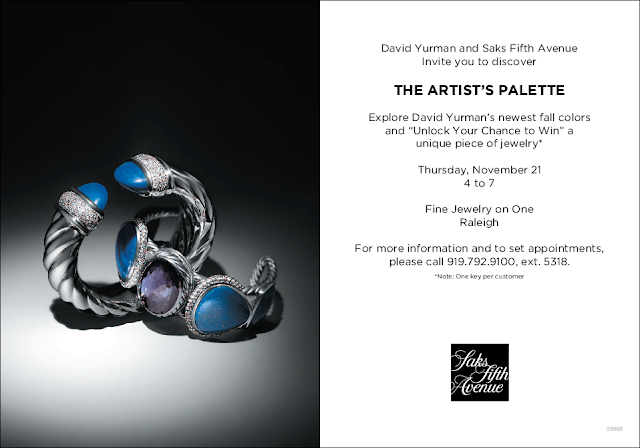 There will be a piece of jewelry on display in a special vitrine. We will be giving out 100 mystery keys and one special key opens the box. Whoever gets the key that opens the box wins the piece of jewelry. The keys will be given out from 4 p.m. to 7 p.m. that day and we will also serve light fare and cocktails.